Ferns (Irish: Fearna, meaning "alder trees" short for Fearna Mór Maedhóg) is a historic town in north County Wexford, Ireland. It is 16 km (10 mi) from Enniscorthy, where the Gorey to Enniscorthy N11 road joins the R745 regional road. 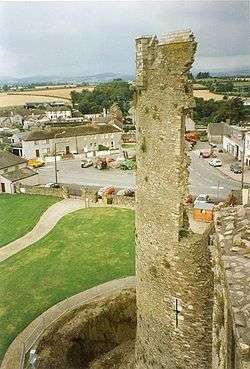 The remains of Ferns Castle are in the centre of the town. View of Ferns from Castle tower. 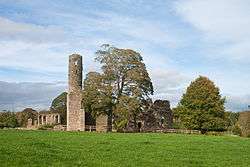 Ferns is believed to have been established in the 6th century, when a monastery was founded in 598 dedicated to St Mogue of Clonmore (St.Aidan) who was a Bishop of Ferns. 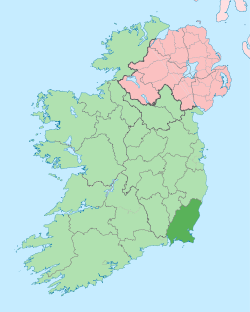 The town became the capital of the Kingdom of Leinster, and also the Capital of Ireland when the kings of that southern part of the province established their seat of power there. It was a very large city then but shrunk in the fire that destroyed most of it. The city stretched all the way down and further than the River Bann (tributary of the River Slaney), if it was not burnt it would've been one of Ireland's biggest cities today. King Dermot MacMurrough founded St. Mary's Abbey as a house of Augustinian canons c. 1158 and was buried there in 1171. Ferns Castle, an Anglo-Norman fortress, was built in the 13th century by William, Earl Marshall. Today about half of the castle still stands. The town also contains the 13th-century St Edan's Cathedral (Church of Ireland) this Cathedral is not the original one but the ruins of the original one can be found a few feet away from the existing one and the existing Cathedral today is not the fully restored Cathedral it was supposed to be (it was order by Queen Elizabeth I to be rebuilt to its former self by the O'Byrnes of Wicklow but they only restored part), which is the Cathedral today. It can be seen as an artefact and a museum and of course a church. The Tower and the Chapter House were added on in the 19th century. It also boasts several high crosses and parts of crosses. The old Catholic church stood at the north of the town until the 1970s, when there was a roof problem. The Parish Priest at the time ordered it, with the go ahead of the parish to demolish it. A convent, St. Aidan’s Monastery of Adoration now stands in its place. The foundation stone of the new Church of St. Aidan was laid on the Feast of St. Aidan, 31 January 1974, the foundation stone lies at the northwest corner wall of the church at the entrance to the sacristy. The new Catholic Church was completed in 1975. In the 2000s the new church went under a major refurbishment since it too had roof problems with leakage of the roof and so on, there was a previously roof problem 15 years after the church was built. They replaced the slates with new composite metal-material, the inside was also refurbished and few minor changes were made to the look of the building. A plaque listing the names of parish priests, from 1644, is on the wall to the right of the altar, beside the pipe organ. The pipe organ in St.Aidan's Catholic Church is more than 100 years old and used to be a "pump" organ until the parish modified it to electricity. The pipe organ was transferred from the old church to the new church and is still in use. The Anglican Cathedral and the New Catholic Church are open daily The Anglican Cathedral - all day and The New Catholic Church - 9 am until around 4pm, usually or sometimes later on Fridays. The 19th century population peaked in 1851, but never reached the levels of medieval times. Lewis's Topography of 1834 claimed the town "consists chiefly of one irregular street, and contains 106 houses indifferently built, retaining no trace of its ancient importance". The Abbey, St.Peter's Church (Catholic and Anglican), and the remainder of the great cathedral are regarded as holy places and regarded as church still this includes the abbey which now has the title of a church and abbey. AI741.1 Kl. Repose of Cúán.u, abbot of Ferna, and Flann.Feórna son of Colmán, king of Ciarraige Luachra, [died]. 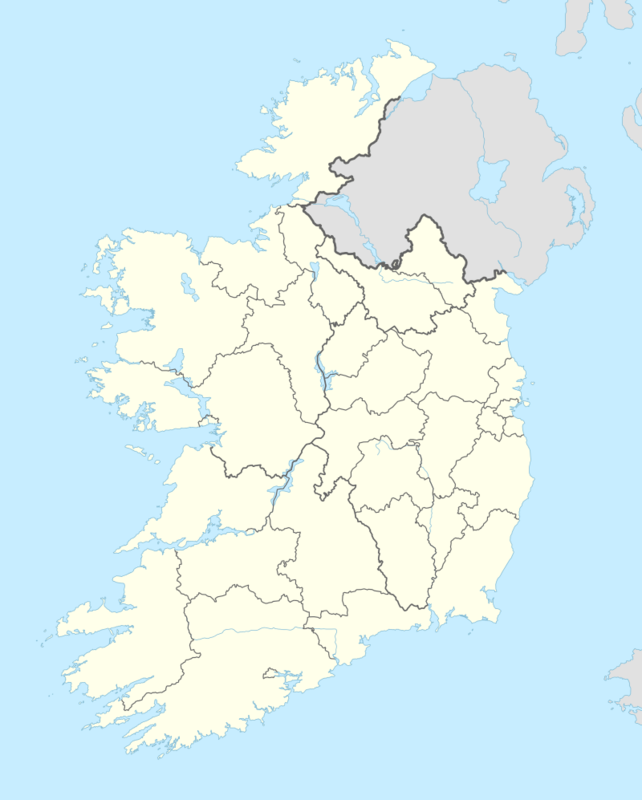 The town gave the name to the Diocese of Ferns (both Roman Catholic and Church of Ireland). The town's religious traditions live on today through the recent establishment in Ferns of a hermitage. The whole history of modern Ireland stems from Ferns – Diarmuid MacMurrough, King of Leinster invited the Normans in 1169 to help him fight his battles (they never left) – he sealed the deal with his daughter Aoife’s marriage to Strongbow. Ferns has evidence of four distinct periods in Irish history. Archaeological digs have revealed habitations from the Bronze, Iron, early Christian and Norman eras. Ferns is located on the N11 route linking Dublin to Wexford. Regular (almost hourly) bus services link Ferns to Dublin and Rosslare are provided by a number of companies. Ferns railway station opened on 16 November 1863, closed to passenger traffic on 30 March 1964 and to goods traffic on 3 November 1975, before finally closing altogether on 7 March 1977. Wikimedia Commons has media related to Ferns, County Wexford. ↑ "Census 2006 – Volume 1 – Population Classified by Area" (PDF). Central Statistics Office Census 2006 Reports. Central Statistics Office Ireland. April 2007. Retrieved 2011-06-11. ↑ "Census for post 1821 figures". Central Statistics Office Ireland. Retrieved 2010-01-28. ↑ "Histpop - The Online Historical Population Reports Website". Histpop.Org. 2007-04-02. Retrieved 2010-01-28. ↑ NISRA. "Census Home Page". Northern Ireland Statistics and Research Agency. Retrieved 2010-01-28. ↑ Lee, JJ (1981). "On the accuracy of the Pre-famine Irish censuses". In Goldstrom, J. M.; Clarkson, L. A. Irish Population, Economy, and Society: Essays in Honour of the Late K. H. Connell. Oxford, England: Clarendon Press. ↑ Gwynn, Aubrey; R. Neville Hadcock (1970). Medieval Religious Houses Ireland. London: Longman. pp. 175–176. ISBN 0-582-11229-X. ↑ Lewis, Samuel (1837). A Topographical Dictionary of Ireland. Dublin, Ireland: Samuel Lewis. p. 624. ↑ "Ferns station" (PDF). Railscot - Irish Railways. Retrieved 2007-10-14.